When the convoy of Americans crosses the border, an agent nods his head out the window. “Welcome to Juarez,” he says. FBI agent Kate Macer looks out at the city. Naked, mutilated corpses hang below a bridge. “It’s brilliant, what they do,” the male agent says. He explains that the cartels in the area kidnap people, cut them up in shocking way then hang the bodies as a message to the locals. The people figure the corpses must have done something to piss off the cartels. But the agent implies the cartels don’t care and the mutilations are random. Just a way to keep order through fear. “It’s brilliant, what they do,” he repeats. Confusion and horror flits across Macer’s face. This isn’t quite what she signed up for. Of course … she wasn’t told what she signed up for. Sicario is a new thriller from director Denis Villeneuve and writer Taylor Sheridan. Sheridan is better known as Deputy Chief David Hale from Sons of Anarchy. This is his second screenplay and I hope he writes many more. The story focuses on the journey of Kate Macer — an FBI agent played by Emily Blunt. She’s a rookie kidnap-and-rescue expert with four successful operations under her belt. The film opens on the fifth. Macer and her team breach a house in an Arizona suburb looking for cartel hostages. She kicks open a door and almost takes a shotgun blast to the face, but dives and kills her assailant. The team can’t find any hostages, just bad guys with guns. But the shotgun blast knocked loose the wall and revealed the fate of the kidnapped. The walls of the suburban home are full of the dead and decaying, their bloodied faces wrapped in plastic to obscure their identity. The camera lingers on the blood, plastic and teeth. Doom-filled orchestral music swells. Macer and her team — everyone, not just the rookies — step into the fresh air and vomit in the sands. Macer didn’t rescue any hostages, but her bosses put the operation down as her fifth success. Then Matt Graver — played with uncompromising and glorious sleaze by Josh Brolin — shows up to ask for help. Graver claims to be a Pentagon adviser who needs an FBI volunteer to help him work a cartel case in El Paso. The truth, and Graver’s actual position, are more complicated. 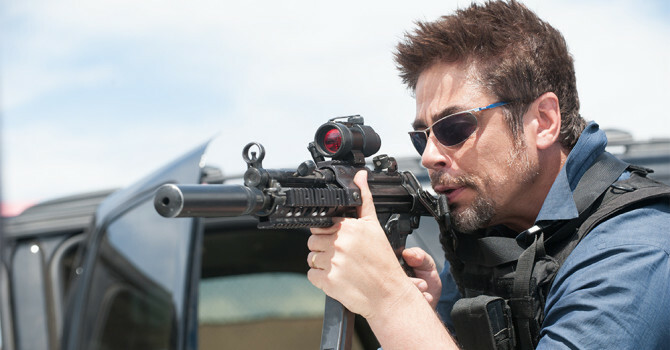 Sicario is good … really good. It’s another entry in the American Cartel Noir genre that explores the despair and nihilism of fighting the never-ending and increasingly surreal Mexican drug war. It’s an action-oriented No Country For Old Men or The Counselor. It’s not quite as smart as either of those movies, but it’s a helluva lot smarter than most of the other action thrillers hitting the market today. It’s also hard to write about without spoiling any of it. The journey of the film is Macer’s journey and audiences need to be as fresh and naive as she is to truly … enjoy is the wrong word … appreciate her journey. She has a front-row seat for the cynical game America has made of the war against the cartels and she gets to see just what some will do to “win” that war. This is a movie about the people who become beasts to hunt beasts. More than No Country or The Counselor, Sicario reminded me of the first season of True Detective. Both have an incredible sense of place displayed in loving, long and lavish aerial camera shots. Both feel grounded in the murky reality of the world they inhabit. Both use music to build dread — not just tension but dread — and both display charismatic anti-heroes so deep inside their personal belief systems they feel only the crushing weight of an indifferent universe. I really wish Sicario had been the second season of True Detective. The film runs over two hours, but I could have watched this story unfold across eight. Benicio Del Toro — about whose character the less said the better — handles the strange language of despair and nihilism far better than did Colin Farrell and Rachel McAdams. “Nothing will make sense to your American ears,” he tells Macer. But Macer — and by the extension — the audience will be made to understand. There will be knowledge but there many not be satisfaction. “Do you like fireworks?” an operator asks Macer after her first successful mission with Graver. “Do you want to see something cool?” He takes her on the roof of the building they’re resting at, hands her binoculars and points toward Juarez. An explosion rips through the city. Tracer rounds flicker across the night sky. The sound of gunfire echoes across the border. The operator smiles. A deep mythology and cynicism runs underneath Sicario. At first blush, the movie seems vague and obtuse, but the screenwriter and director left all the answers in the work. Entire backstories and motivations take place in a look, in a small line of innocuous dialogue … and are lost, like the sound of screams mixing with the noise of a jet engine during take off. These answers — such as they are — will or won’t satisfy the audience depending on the viewer’s own beliefs and biases. The final 10 minutes of the movie will divide people. Everyone will understand, but not everyone will accept.